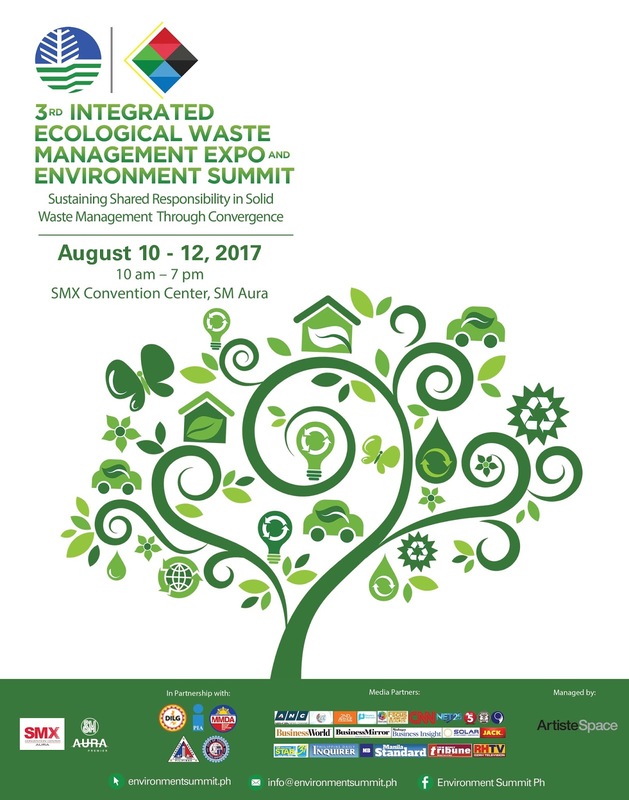 The 3rd Integrated Waste Management Expo and Environment Summit is happening on August 10-12, 2017 at SMX Aura, Taguig City. An initiative of the DENR - Environmental Management Bureau (EMB), the Expo aims to raise the bar of environmental awareness of consumers and beef up efforts in solving the rising problem of solid waste in Metro Manila and other urban areas in provinces across the country. The 3rd Integrated Waste Management Expo and Environment Summit is open to the public, including government agencies and non-government organizations. The Expo offers various activities like forums, talks and workshops that bear interesting topics on environmental protection, renewable energy, sustainable livelihood, and updates on consumer goods that help save the earth. The Expo aspires to heighten a proactive awareness on issues that bear upon the environment and its ecological well-being. The ever-rising mountains of trash in our landfills, our rivers, waterways, and seas, is a serious matter of concern that has stared us in the eye for decades. Good laws have been passed, government efforts on alleviating garbage problems in Metro Manila and major urban centers across the country have seen improvements since R.A. 9003 or the “Ecological Solid Waste Management Act” was put in motion in 2000. Amazingly, seventeen years later, we are still in neck-deep sea of rubbish. Major gaps cry out to be filled because the solution lies not only on laws or government effort, but at the source of waste itself — the consumers. The Expo hopes to boost efforts in promoting a deeper commitment among Filipinos in every household, business establishments, and institutions in achieving positive social and environmental impact. Visitors will gain invaluable information, instruction, and insight on eco-friendly solutions that is practical, cost-efficient and sustainable. Reduce, Reuse, Recycle — the global battle cry for the environment resonates. Redesigning resource life cycles so that all products are reused, imitating nature’s sustainable cycles, would mean no trash is sent to landfills and incinerators — no more air pollution, no more water contamination. Changing our consumer lifestyles and practices is the solution to making this vision possible. We can bring about positive change if we work together as a nation — for the environment, for the country, for every Filipino. We hold the key. The 3rd Integrated Ecological Waste Management Expo and Environment Summit is organized by DENR - Environmental Management Bureau in partnership with Department of Interior and Local Government, Metro Manila Development Authority, Philippine Information Agency, Quezon City and Taguig City. You may visit environmentsummit.ph for more information.